Il Royal Pavilion è una antica residenza reale situata a Brighton, Inghilterra. E 'stato costruito in tre tempi, a partire dal 1787, come una residenza sul mare per George, Principe di Galles, Principe reggente dal 1811. Viene anche definito come il “Brighton Pavilion”. E' stato costruito in stile indo-saraceno prevalente in India per la maggior parte del 19° secolo, con gli interni in stile cinese più stravaganti mai realizzati nelle isole britanniche. The Royal Pavilion is a former royal residence located in Brighton, England. It was built in three campaigns, beginning in 1787, as a seaside retreat for George, Prince of Wales, from 1811 Prince Regent. 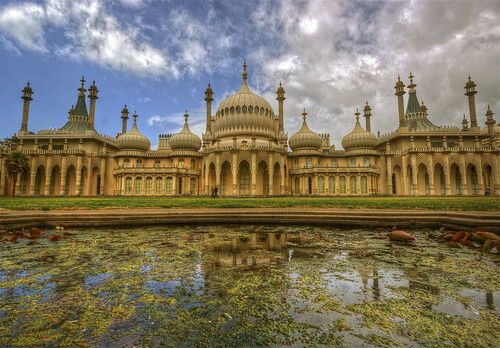 It is often referred to as the Brighton Pavilion. It is built in the Indo-Saracenic style prevalent in India for most of the 19th century, with the most extravagant chinoiserie interiors ever executed in the British Isles.